Essentials of Marketing: A Marketing Strategy Planning Approach" is about marketing and marketing strategy planning. At its essence, marketing strategy planning is about figuring out how to do a superior job of satisfying customers. This author team takes that point of view seriously and believes in practicing what they preach. Instructors and students can trust that this new edition of "Essentials of Marketing" 14e- and all of the teaching and learning materials that accompany it - will satisfy every instructor and students' needs. This author team pioneered an innovative structure-- using the "four Ps" with a managerial approach--for the introductory marketing course. It has become one of the most widely used business textbooks ever published because it organizes the best ideas about marketing so that readers can both understand and apply them. The unifying focus of these ideas is on how to make marketing decisions that a manager must make in deciding what customers to target and how best to meet their needs. Over many editions of "Essentials of Marketing," there have been constant changes in marketing management and the marketing environment. Some of the changes have been dramatic, and others have been subtle. As a result, the authors have made ongoing updates to the text to reflect marketing's best practices and ideas. What's unique about "Essentials of Marketing"? The four Ps framework, managerial orientation, and strategy planning focus have proven to be foundational pillars that are remarkably robust for supporting new developments in the field and innovations in the text and package. 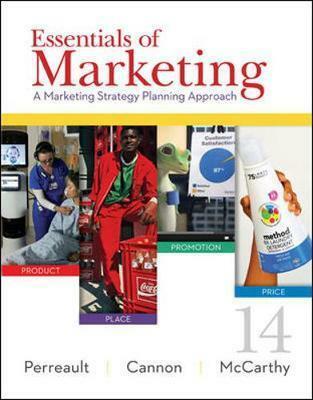 "Essentials of Marketing" teaches students analytical abilities and how-to-do-it skills that prepare them for success. The author team has deliberately included a variety of examples, explanations, frameworks, models, classification systems, cases, and "how-to-do-it" techniques that relate to our overall framework for marketing strategy planning. Similarly, the online "Marketing Plan Coach" helps students see how to create marketing plans. Taken together, these items speed the development of "marketing sense" and enable the student to analyze marketing situations and develop marketing plans in a confident and meaningful way. They are practical and they work. The authors emphasize careful integration of special topics. Some textbooks treat "special" topics--like relationship marketing, international marketing, services marketing, marketing and the Internet, marketing for nonprofit organizations, marketing ethics, social issues, and business-to-business marketing--in separate chapters. The authors deliberatively avoid doing that because they are convinced that treating such topics separately leads to an unfortunate compartmentalization of ideas. The comprehensive package of materials gives instructors the flexibility to "teach marketing their way"- or for the student, the ability to "learn marketing their way.